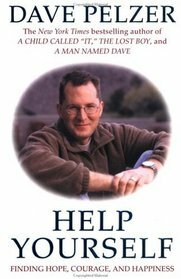 This is a wonderful book I’m reading by David Pelzer. I had already read his books, A Child Called “It”, The Lost Boy, and A Man Named Dave. This is a sad story that doesn’t end that way. I have read so many stories of tragedy and pain and they usually leave you sorrowful, wishing there was some way to help ease the pain. This story ends with a man that came through his pain to help YOU. I have been fighting with forgiveness for years and years. I hold grudges and then the negative feelings eat away at me. I have been trying to stop holding onto the pent up anger and forgive but as of yet I haven’t had much luck. Sometimes I push it into a dark corner in the back of my mind for a while but it always comes back when I least expect it. You never know when someone might say something that brings it all back again. Then, as I was reading this book, David Pelzer began to speak about FORGIVENESS. Now if he can do it I should be able to! I bought this book simply because it had his name and face on it and figured it was simply more of his story but it’s not. It’s about forgiving and moving on, about finding real happiness that is blocked out by the dark clouds of hate. He has already done it; he moved on. This book is for helping others do it too. I hope it can help me. I have decided to make this book one of my permanent collection.